Monroe Gallery of Photography is honored to announce a very special exhibition of photographs by the renowned photojournalist Bill Eppridge. Mr. Eppridge will be our guest at the opening reception in his honor on Friday, July 2, from 5 to 7 PM. Mr. Eppridge will also be in the gallery Saturday, July 3. This is a rare opportunity to meet one of the most accomplished photojournalists of the Twentieth Century. The exhibition will continue through September 26. Bill Eppridge has captured some of the most significant moments in American history: he has covered wars, political campaigns, civil rights, heroin addiction, the arrival of the Beatles in the United States, the summer and winter Olympics, Vietnam, Woodstock, (see the special 40th Anniversary audio and slide shows from the New York Times and Life), and perhaps the most dramatic moment of his career - the assassination of Senator Robert Kennedy in Los Angeles. Over the last 50 years his work has appeared in numerous publications, including National Geographic, Life, and Sports Illustrated. He is the recipient of the 2009 Missouri Honor Medal for Lifetime Distinguished Service in Journalism awarded by The Missouri School of Journalism. Recently, The Beatles! Backstage and Behind the Scenes, a photography exhibition of Bill's images of the band was displayed at the Smithsonian Institution, National Museum of American History in Washington, D.C, before starting a world tour. In 2008, his photographs were included in the exhibition Road to Freedom: Photographs from the Civil Rights Movement 1956 - 1968 at the High Museum, Atlanta, Georgia, later traveling to the Skirball Center in Los Angeles and the Bronx Museum of the Arts in New York. Additionally, Eppridge's photographs are included in the exhibitions Voyeurism, Surveillance, and the Camera since 1870; Tate Modern, London; San Francisco Museum of Modern Art (2010); and A Star is Born: Photography and Rock Music Since Elvis Presley, Museum Folkwang, Germany (2010). View the exhibition on-line here. How can a building so glorious face such an uncertain future? That question drew photographer Eric Smith to Detroit's Michigan Central Station, a 1913 Beaux-Arts landmark that closed in 1988 and now stands in a state of ruin. "A few years ago, I heard that artists were finding ways to secretly get into the station—a treacherous proposition, but one I couldn't resist," he says. "And the experience, once I got inside, was incredible. 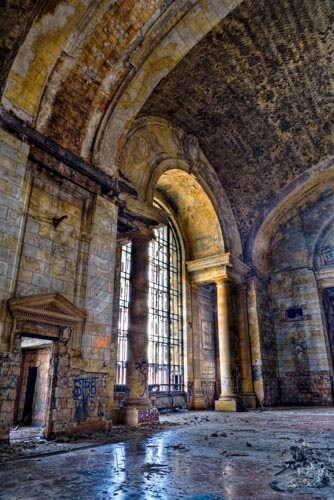 That main waiting room is enormous and, despite its current condition, still wonderful. I photographed the destruction caused by water and neglect—and vandals—and tried to capture the sheer drama of the interior." Smith employs a photographic technique called High Dynamic Range Imaging, or HDRI. "By shooting a series of exposures that are later processed with a computer program, I can reveal all the color, shadows, highlights, and depth that standard photography misses." 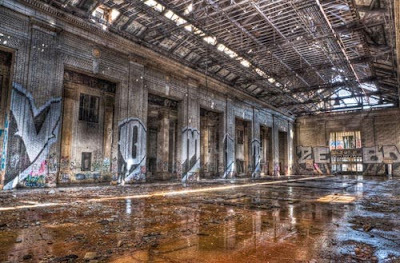 In the months since Smith captured these striking images, the graffiti-filled station has been secured and fenced to prevent trespassing. Phil Frame, director of communications for CenTra Inc., a diversified holding company that owns the station, says, "The site is dangerous, and we don't want anyone hurt. We're trying to keep it structurally very sound, and would prefer to save it if we can." Proposals under consideration include adapting space for law enforcement or judicial offices, Frame says. "We also think it would make a great site for the Michigan State Police Crime Lab. We're studying feasibility, but no project has been lined up at this time." 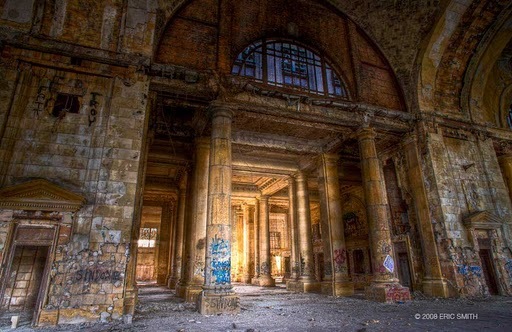 Designed by Warren & Wetmore and Reed & Stem (the firms responsible for Grand Central Terminal in New York City), the depot complex includes an 18-story office tower and a three-story station.The cavernous 54-foot-high waiting room was inspired by the Roman baths of Caracalla. "If it wasn't so beautiful it might have disappeared long ago," Frame says. "But it survived. It's absolutely unforgettable." 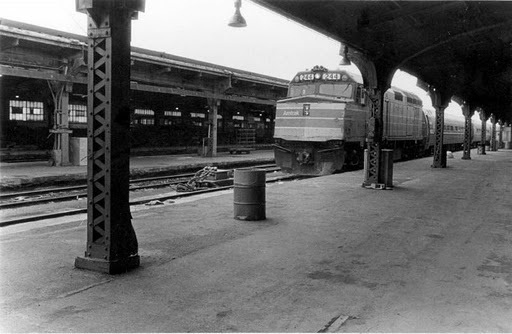 Photographs courtesy the Detroit Historical Society and Eric Smith. see more of Smith's photographs here. It's hard to imagine a place that says more about the American experience than Ellis Island. For twelve million people, Ellis Island was the doorway to a new life. The hopes and dreams of several generations of immigrants began and sometimes ended there, and there are few American families who can't trace their heritage back to someone whose first footsteps on American soil happened at Ellis Island. For five years, renowned photographer Stephen Wilkes had free reign of the island's hospital complex. 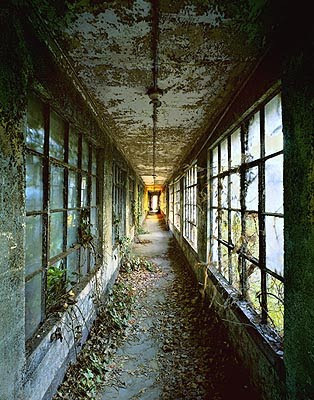 Neglected for nearly fifty years, the buildings were in an extreme state of disrepair: lead paint peeled from the ceilings and walls, vines and trees grew through the floorboards of once cramped wards. In these long-abandoned spaces, Wilkes discovered an unyielding solitude, yet also found undeniable evidence of life, not only in the implicit remembrances of the people who resided there, but in the radiant, beckoning light in which these scenes were captured. Organized by the Michener Art Museum with the cooperation the George Eastman House, Rochester, and ClampArt Gallery, New York, this exhibition presents a selection of Wilkes's evocative contemporary images of Ellis Island as well as a group of vintage prints from the Eastman House collection by the legendary photographer Lewis Hine (1874-1940), who began documenting the immigrant experience around 1904 and produced a major body of work focusing specifically on Ellis Island. View the full collection of Stephen Wilkes' Ellis Island photographs here. 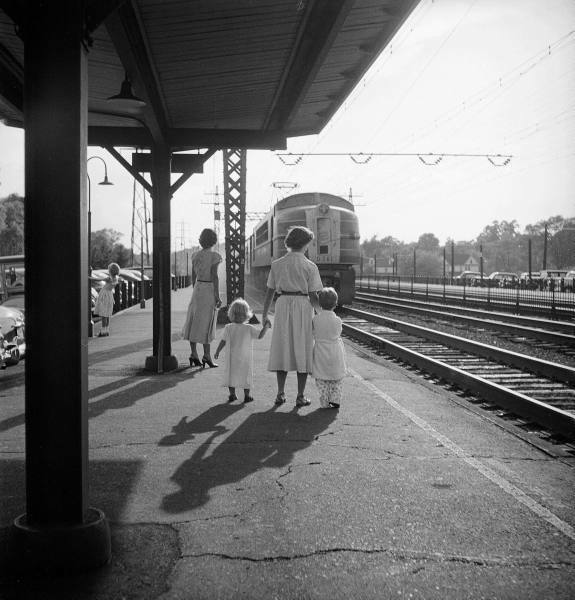 John Dominis: Jacques D'Amboise playing with his sons, Seattle, Washington, 1962 ©Time Inc.
Nina Leen: Wife and children of insurance broker Charles Hoffman waiting for Hoffman at commuter train station, Darien, CT, 1949 ©Time Inc.
REVIEW: " For anyone interested in the history of this mixed bag of a nation, "American Edge" the museum-quality Steve Schapiro photography exhibition at Monroe Gallery is not to be missed." 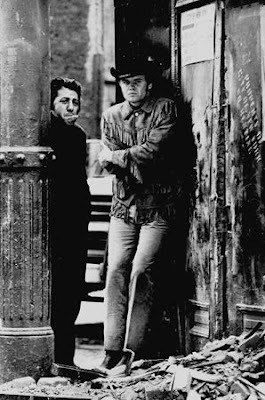 For anyone interested in the history of this mixed bag of a nation, "American Edge" the museum-quality Steve Schapiro photography exhibition at Monroe Gallery through June 27 is not to be missed. The majority of 57 potent black-and-white images are from the tumultuous '60s, the beginning decade of Schapiro's lifetime in photojournalism. Born in New York City in 1944, Schapiro shot his earliest self-initiated documentary essays "Narcotics Addiction in East Harlem" and "Arkansas Migrant Workers" in 1960. These independent projects brought him assignments from the big picture magazines of the day, including LIFE, Look and Rolling Stone. Schapiro was one of those meddling northerners who went south in 1965 to join the Selma to Montgomery marchers who were seeking the right to register to vote. The photographer heeded local advice to cut his hair and not to wear his leather jacket. Over the five days it took to complete the 54-mile march, the crowd grew from 4,000 to more than 25,000. Armed with his handheld 35 mm camera, Schapiro found the courage in those he documented (and in himself) to join a campaign that was met with overwhelming violence and that resulted in the deaths of two men — the Rev. James Reeb, a white pastor who was beaten to death, and Jimmy Lee Jackson, a black activist who was shot by a police officer. 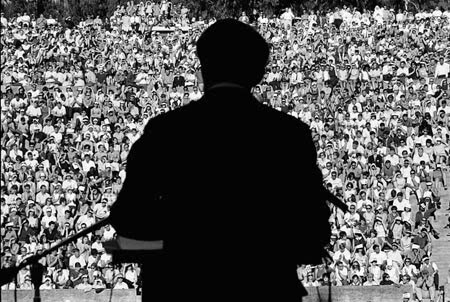 While there are many differences that divide America's epochal 1960s from today, the similarities are deep enough to lay claim to the current American moment, where "edges" seem to have proliferated and feel ever more vertiginous. Although the '60s was an era when Barack Obama's election to president was an impossible dream, it was a time when many Americans believed they were making inevitable progress toward equality. A "post-racial" society with the end of racism and xenophobia seemed to be in site. More than 40 years later, tolerance seems the impossible dream. Despite our being globalized and electronically linked now, Schapiro's 1964 image of follow-the-leader white men in Florida carrying their "Segregation Forever" sign resonates with up-to-the minute virulence of anti-immigration hysteria, as well as the incendiary and rampant hate speech against our black president. This exhibition appropriates the title of Schapiro's first and very deluxe monograph published in 2000 by Arena Editions (a now defunct press founded in Santa Fe). More than half of the silver prints in the gallery were first published as art in this book, including the two iconic images chosen for the end papers. On view (and used as the book's front end papers) is the ominous "Robert Kennedy in Berkeley, Calif., 1966," with Kennedy's dark silhouette looming over a sea of faces turned toward him and the sunshine. 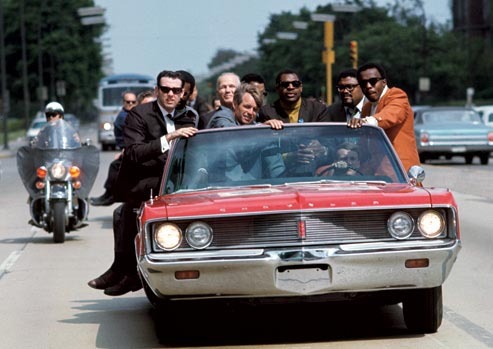 It is a prescient image of Kennedy's assassination two years later, when his demise left a huge black hole in the American political landscape and psyche. Also on view (and used as the book's back end papers) is the achingly resonant "Jerome Smith, Mississippi, 1965." No one could ask for a more perfect composition. Smith, a young Civil Rights worker in overalls, is framed in profile by his church doorway in the "thinker's pose," precisely echoing the pose of a pondering Christ in the Garden of Gethsemane as depicted in the church's stained glass window. Schapiro has always acknowledged his debt to the renowned W. Eugene Smith, the photographer he tried to emulate, as he did Henri Cartier-Bresson. His monograph is dedicated simply to "Smith." Yet, for all his predecessors' greatness, Schapiro's work is not as sentimental as Smith's or as distant as Cartier-Bresson's. Schapiro's work is more self-conscious and feels more embedded in his generation's disorienting times. 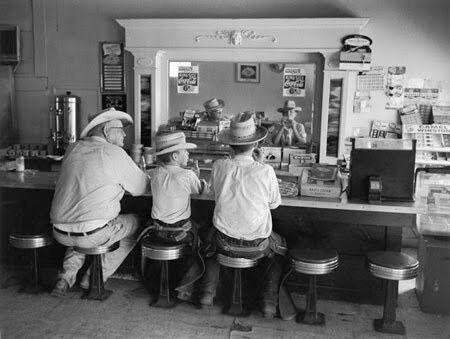 In light of earlier photojournalists, the tone of Schapiro's work is closer to WPA-era Dorothea Lange and Hungarian-born André Kertész. 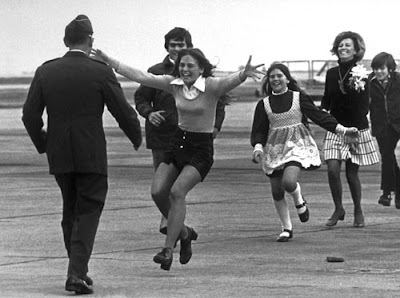 In addition to multiple images of Martin Luther King and Robert F. Kennedy, Schapiro captured many anonymous players who had their moment on the stage of the '60s, such as a bloody student at the Columbia University riots, lonely supermarket parking lot picketers, stoned flower children in Haight Ashbury, and frenzied go-go dancers. These unnamed actors are shot with the same involvement as his celebrity images, including Warhol's factory, the Kennedys' Camelot, James Baldwin, Rosa Parks, Janis Joplin, Ike and Tina Turner, Alan Ginsberg, and Samuel Becket. After popular magazine assignments started to wane, Schapiro began working for both the music and movie industries shooting Hollywood stars on the set, and his celebrity images retain the on-the-road grit of his photo journal essays. Schapiro photographs are black-and-white silver prints (in limited editions of 25) and the magical emergence of images from negatives with wet chemicals darkroom, before transition to the now-dominant flat-screen digital technology. The tremendous power of his work reminded me of a very recent symposium (April 22) organized by the San Francisco Museum of Modern Art. Thirteen leading American artists, curators and critics were invited to address the rather silly question "Is Photography Over," a variation on the old straw dog "Is Painting Dead?" Of course, this is an ever-ready topic raised by institutions and academics that need issues to discuss. But, just as with every other medium an artist chooses to use, yes, the medium is dead. Every medium is dead. It becomes art precisely when the artist breathes new life into it. Fortunately, for those of us who like looking at art, the medium is a tool of the artist and not a ghetto. 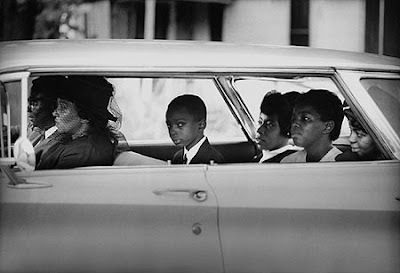 Also, if you like Steven Schapiro's photographs, keep your eyes open for the traveling exhibition "The High Road to Freedom: Photographs from the Civil Rights Movement, 1956-1968," organized by the High Museum of Art in 2008. Currently on view at the Bronx Museum of Art in New York City, review here.) The exhibition prominently features Schapiro's images documenting the legal end to American apartheid and it is currently "on the road," and, hopefully, like America, a work still in progress. See the exhibition on-line here. The nonprofit organization, Center, founded in 1994, supports, promotes and provides opportunity to gifted and committed photographers. It is the aim of Center to help photographers identify their creative goals and accomplish them through feedback, support and opportunities. The annual programs include the Project Competition, the Choice Awards, Santa Fe Prize, Excellence in Teaching Award, Review LA, Review Santa Fe and the Center website. Public exhibitions and expositions of the work are held in conjunction with the Awards and Portfolio Reviews. Center’s Review Santa Fe is the premier juried portfolio review event in the U.S. It is a weekend conference designed for photographers who have created a project or series and are seeking feedback, critical discourse and networking opportunities with professionals looking for new work. Up to 100 photographers are selected to meet with esteemed curators, editors, publishers, gallerists and others eager to discuss photography. Michelle Monroe of Monroe Gallery of Photography is a participating reviewer, click here for the full list. And here is a list of photographers and their images. Photographers receive 9 twenty-minute portfolio reviews, a night of Portfolio Viewing open to the public and inclusion in the online Photographers Listing. Collectors and lovers of photography will appreciate this extraordinary opportunity to view the compelling projects of 100 nationally recognized photographers, including many on the cusp of wider acclaim. Please join us on this one special evening to view a broad range of contemporary photography, encompassing social, environmental and political issues, plus exceptional fine-art projects. the artists. 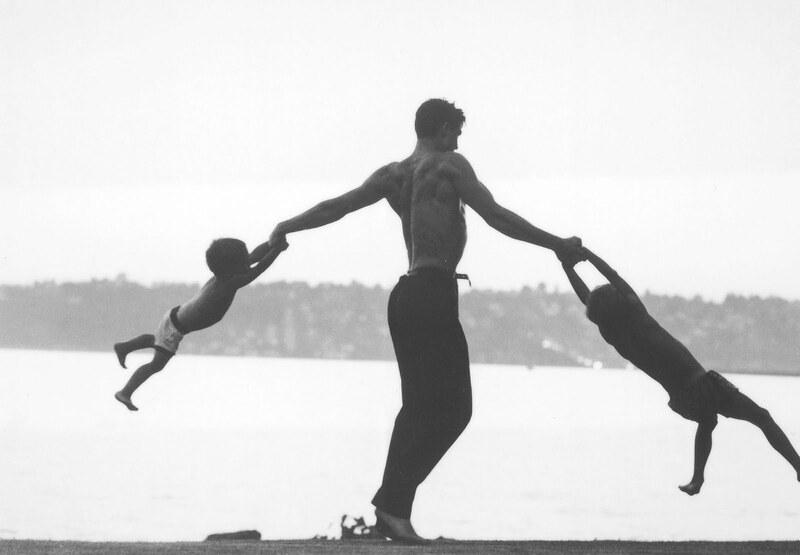 If you love contemporary photography, you won’t want to miss this lively event. For more information, contact CENTER. As special photographer on the sets and locations of Francis Ford Coppola's The Godfather trilogy, Steve Schapiro had the remarkable experience of witnessing legendary actors giving some of their most memorable performances. Schapiro immortalized Marlon Brando, Al Pacino, Robert De Niro, James Caan, Robert Duvall and Diane Keaton in photos that have since become iconic images, instantly recognisable and endlessly imitated. Gathered together for the first time in this book are Schapiro's finest photographs from all three Godfather films, lovingly reproduced from the original negatives. With contextual essays and interviews covering the trilogy in its entirety, this book from Taschen contains over 400 color and black & white images. Schapiro's images take us behind the scenes of this epic and inimitable cinematic saga, revealing the director's working process, capturing the moods and personalities involved, and providing insight into the making of movie history. Previously restricted to 1,000 Limited Edition copies, this is the unlimited trade edition for cinephiles and 'family' members on a budget! More details here. 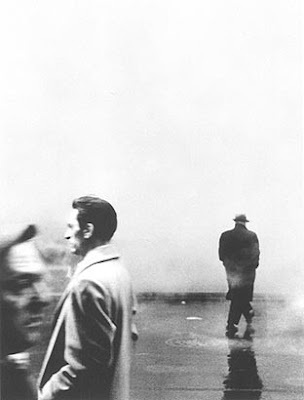 Steve Schapiro is a distinguished journalistic photographer whose pictures have graced the covers of Time, Sports Illustrated, Life, Look, Paris Match, and People, and are found in many museum collections. He has published two books of his work, American Edge and Schapiro's Heroes. 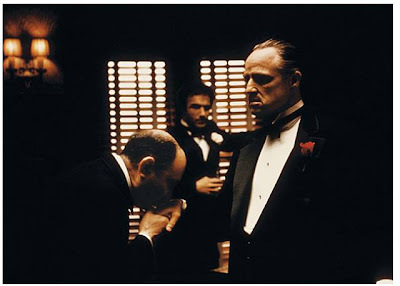 In Hollywood he has worked on more than 200 motion pictures; his most famous film posters are for Midnight Cowboy, Taxi Driver, Parenthood, and The Godfather Part III. His photographs are currently featured in a retrospective exhibition at Monroe Gallery of Photography, Santa Fe, through June 27. Paul Duncan has edited 50 film books for TASCHEN, including the award-winning The Ingmar Bergman Archives, and authored Alfred Hitchcock and Stanley Kubrick in the Film Series.